Historical records indicate muskoxen disappeared from Alaska during the late 1800s. They were first transplanted to Nunivak Island from Greenland in 1935 and 1936. 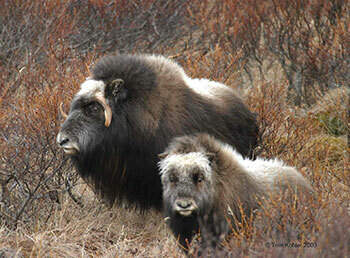 Once the population increased, Nunivak Island muskoxen served as the source population for transplants to northern and western Alaska during 1969–1980. Inadequate consultation with residents living in the transplant areas caused lack of acceptance of these animals that continues to complicate management today. Today, muskoxen and people share similar habitats during the summer months, and muskoxen are often found near subsistence camps, communities and airports—causing a variety of conflicts. For more information on muskoxen you can read a general description, life history, range and habitat, management and identification by reading the muskox profile. Keep dogs under control at all times in muskox country. Muskoxen can easily kill or injure dogs. Muskoxen are very patient with people, but very impatient with dogs. Muskoxen are not likely to run from you as moose and caribou do. Muskoxen may be very tolerant and allow you to get surprisingly close. However, they are powerful animals and will react if they feel threatened in their space. Pay attention to body language. A muskox that has stopped feeding, walking, or resting has noticed you and may become agitated. 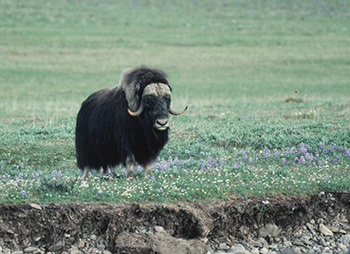 A stressed muskox group may form a defensive line and face you. Stressed and agitated animals may begin to sway their head from side to side. Give stressed muskoxen room by retreating from the area. As with any other wild animal, do not agitate or approach cows with calves. Bull muskoxen are more aggressive during the fall breeding season which takes place from August through October. 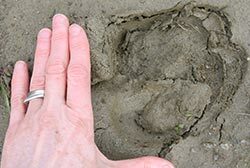 Precautions should be taken to avoid disturbing males when in rut. View muskoxen from at least 150 feet, give the group a wide birth, and do not box muskoxen in with people or vehicles. If you are charged, run; do not stand your ground. Muskoxen may tend to move into areas around homes and cemeteries because they offer structures that are appealing for rubbing. Structures or willows also offer muskox a sense of safety and security. 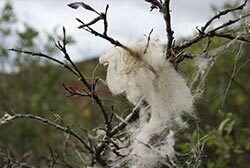 Being mindful of structures or willows around your home that may entice muskoxen, may help prevent their presence in those areas. Muskoxen stand their ground; as a result, it is very difficult to drive muskoxen from areas. Do not feed muskoxen, it is both dangerous and illegal. Enjoy watching muskoxen from a safe distance and avoid unnecessary disturbances. Report dangerous muskox situations to ADF&G using the wildlife encounter form.